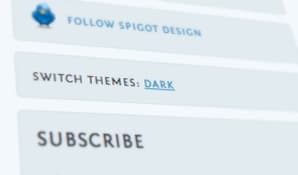 As you can tell, we’ve launched a new look to the site – a lighter, brighter version of Spigot Design for those who thought the previous design was too dark and brooding. For those who liked the site just fine the way it was, check out the link on the home page that will allow you to switch it back (and forth). Give it a click and you’ll be taken back to the dark design, and should remain that way the next time you happen to grace these pages again. Any feedback would be well appreciated, especially if you find a bug.